The Firehawk Indy 500 tire is Firestone’s ultimate in sport performance, inspired by our racing heritage. With our new tread design featuring a proprietary Pulse Groove water channel, we have dramatically improved handling and braking on wet roads (as compared to the Firehawk Wide Oval Indy 500 tire). And with a new outer tread design, you can take a corner with great confidence. 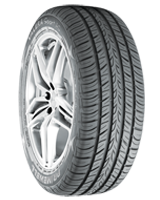 So if you’re a car enthusiast looking for a tire that can provide extreme performance and extreme fun, this is the tire for you. W speed rated.